Baptism is the biblical name for Christening and these are a very special way to welcome a child, or a person of any age onto God’s family. These take place either as part of our 11am service or at 1pm on Sundays. Baptisms are free and an excellent way to celebrate new life and a new start. You must live in the parish to be eligible or have a connection to our church. A thanksgiving service is an alternative to baptism when parents don’t feel they can make the promises to God involved with the Baptism service and want their child to make a more formal decision for themselves when they are old enough to do so. Thanksgiving services are part of our regular 11am Sunday service. Should you wish to discuss the possibility of a baptism or thanksgiving service please contact Louise our vicar. Baptisms are free of charge - all are welcome. You might be reading this because you’ve decided to get married. If so - congratulations! There are many buildings now licensed for marriages, where couples can say their vows before their family and friends. A church wedding also includes family and friends, but most importantly recognizes God at the centre of the marriage ceremony. Christian vows are said in the service and prayers, readings and hymns are usually included. Were baptised in the parish. Were confirmed in the parish. Lived in the parish continuously for 6 months. Attended worship here for 6 months. Lived in the parish continuously for six months. Attended worship here for six months. or if a parent or grandparent of either of you was married in the parish. 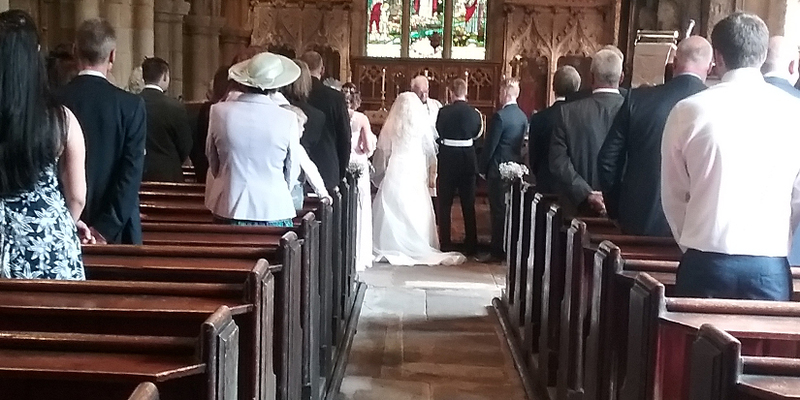 The wedding ceremony with the reading of banns and your marriage certificate costs £446. 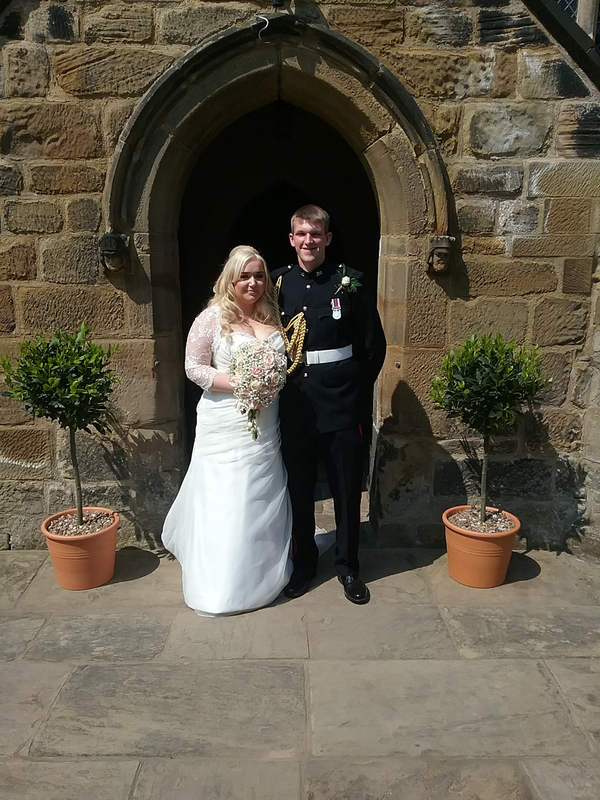 If you choose to get married between the months of September and May there is also an additional charge of £28 for the heating. 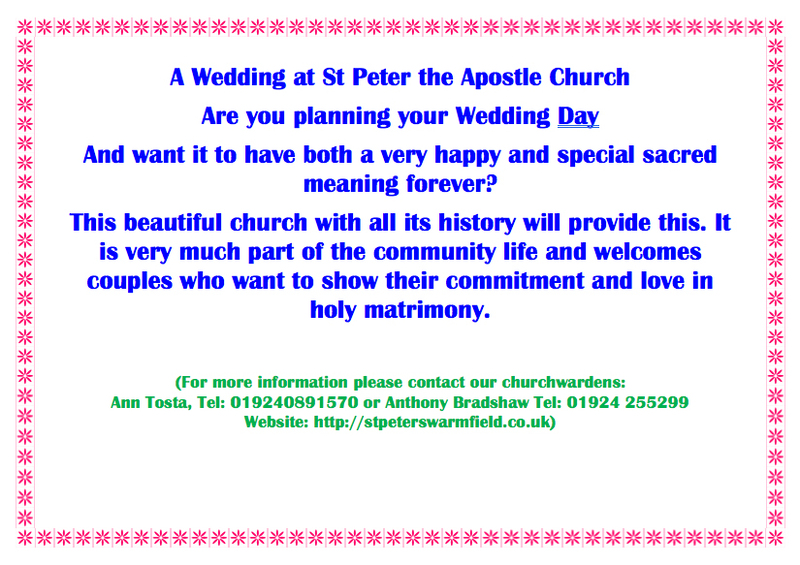 If you would like any further information about getting married at St Peter’s please give our vicar Louise a ring. When a loved one dies there are a tremendous number of things to organize. In the first instance please contact a funeral director of your choice. They will then liaise with us according to your burial or cremation needs. 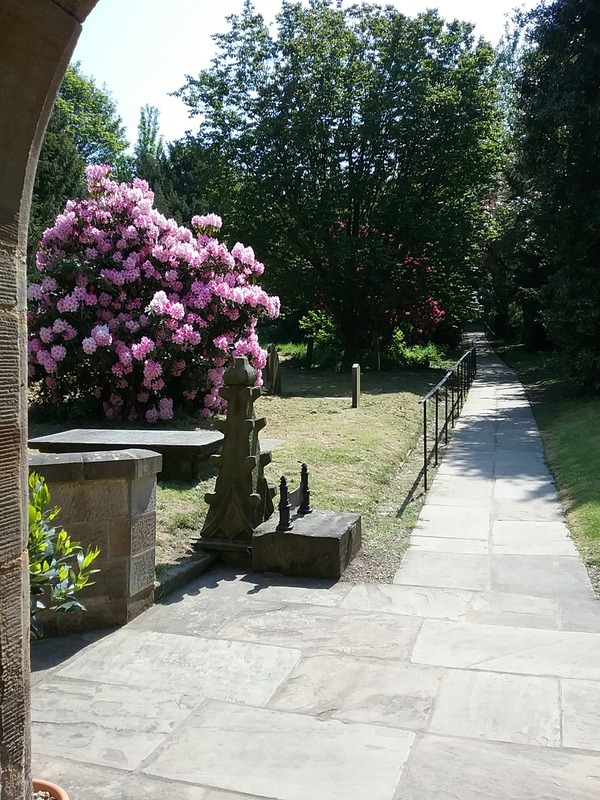 We have our own church graveyard and our vicar often also takes funerals at both Wakefield Crematorium and Pontefract Crematorium. If we can be of any help at all in the event of a death please do not hesitate to get in touch. Every year we have a memorial service, which this year is on Sunday 6th November at 11am. The families of those people whose funerals we have conducted over the past three years are personally invited to this. This is an opportunity to remember loved ones who’ve passed away and to light a candle in their memory.